TuneIn Radio has made some news recently, most notably with its inclusion of radio broadcasts for all NFL games. Granted, this requires the customer to pony up $7.99 per month for a premium subscription and there is no video, but it's a heck of a lot cheaper than NFL Sunday Ticket and radio broadcasts are pretty descriptive about plays. Now the service is arriving on Windows 10, the latest operating system from Microsoft. This is a Universal App and brings the full content of the service to the platform. This gives users the ability to not only pin the app, but also pin their favorite stations. The service is also excited about Cortana which allows for launching the app by voice -- simply say "Cortana, launch TuneIn" and you're off and running. This allows for easy sign-in as, like its web-based counterpart, you can use Facebook to log in or use your email address to get moving. 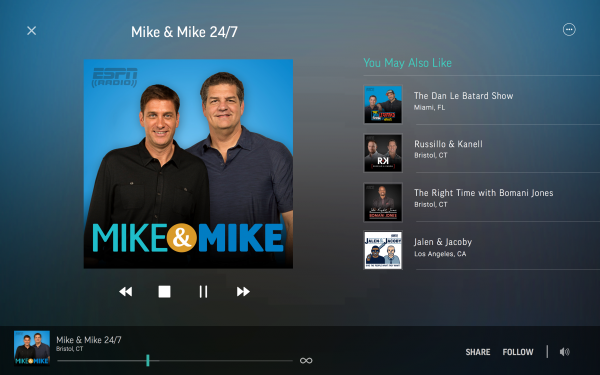 "We can’t wait to hear what you think of the new TuneIn Radio app for Windows 10! You’ll find the app available to download for free here in the Windows Store. If you have any questions, check out our FAQ page, or tweet us at @TuneInSupport", the service states.